You can easily make your own “Friendly Phil the Frog” hand puppet! 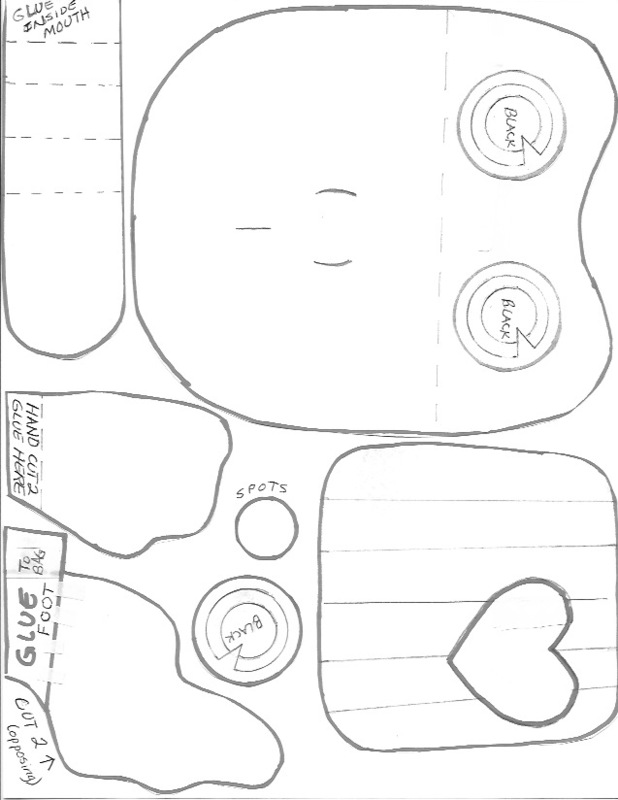 This pattern may be copied for personal or educational, non-commercial use. 1. COLOR Color with markers or crayons the belly and eyes on the first pattern copy. Then cut out. If you like, you can cut out a heart from shiny gold paper. But if using markers/crayons to color the heart, use orange on the edges and blend with yellow. * Head, arms, and feet from green construction paper. Be sure to cut two each of hands and feet. * Cut tongue from red construction paper. Fold as indicated. This way the tongue can come out to catch a fly! Use a raisin or copy the fly below. * Have an adult draw on “nose lines” on the green head as on pattern. * Glue folded tongue in the “mouth”, under the crease of bag bottom. * Fold the head as indicated on the pattern. * Glue eyes on the green head piece using the pattern to position correctly. * Glue the bottom part of the “head” onto the rectangular bottom of the bag, making sure the bag bottom does not show. DO NOT glue down the top part above the fold where the eyes. This fold will give some depth to the head. * Glue the hands and feet onto the bag in the side creases. Let the glue dry a bit with the puppet under a heavy book for five minutes. 5. TAPE Reinforce the glued parts to bag with clear tape where it will not be seen. ** If you used a bag that needs to be colored green, you may do this after taping. There will only be two sides that need to be painted alongside the belly and if you want you may paint the back. Make the unglued top of the head where the eyes are stand up a bit. YOUR PUPPET IS READY TO LEAP!!! When you’re finished your puppet will look almost like Granny Vee’s!